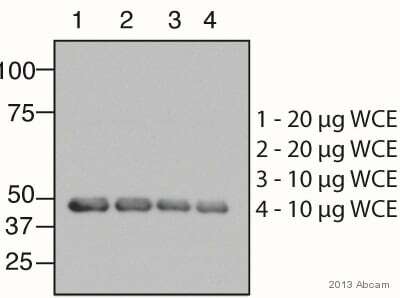 This antibody is specific for GFP and GFP fusion proteins. within Aequorea victoria GFP aa 1-100 (N terminal). The exact sequence is proprietary. 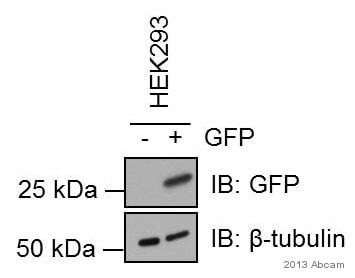 HeLa whole cell lysate (ab29545) can be used as a positive control in WB. Our Abpromise guarantee covers the use of ab32146 in the following tested applications. Is unsuitable for ICC/IF or IP. 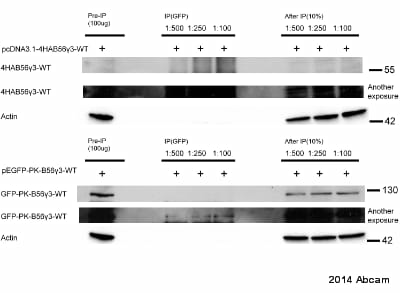 Blocking and dilution buffer: 5% NFDM /TBST. 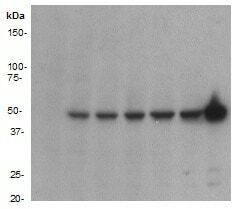 Publishing research using ab32146? Please let us know so that we can cite the reference in this datasheet.